Workers in Indiana may find themselves devastated after they are diagnosed with bronchiectasis. Since the medical condition has no cure, the situation is made especially bad if you have family members that heavily depend on you and your income. Individuals may suffer from a long-term disability when the bronchial tubes in their lungs become enlarged and damaged. The common result of this affliction is numerous breathing problems due to infection. To live normally, individuals who have bronchiectasis are given costly treatments to lessen the risk of infection. Patients are prescribed with antibiotics and bronchodilators to suppress bacteria and to open up air passages. Other medications are also prescribed for patients to release mucus and to control chronic coughing. In more severe cases, patients may need to undergo surgery if bleeding occurs inside the lungs. In some situations, patients are also required to undergo therapy or a daily procedure to extract mucus. If you become disabled by bronchiectasis, an attorney can help you pursue long-term disability insurance benefits. 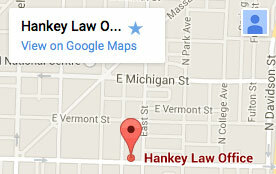 Find out how Hankey Law Office in Indiana may help you today by calling (800) 520-3633.